Forum Index > Historical Arms Talk > Great halls at Tissø & Viking Age Swords from the area. Posted: Fri 13 Feb, 2015 9:53 am Post subject: Great halls at Tissø & Viking Age Swords from the area. Tissø (“Lake of Ti/Tir“) has been used for sacrificial deposits through the ages. The name suggests, that the Lake was holy and attributed to Tí/Tír as he was called in East-Nordic (the West-Nordic equivalent has “ʀ-umlaut“, that turned the name into Tý/Týr, which proves that “Old Norse“ is in fact West Nordic and should thus be called Old Icelandic as it is NOT ancestral). The plural form (meaning “Gods“) was Tívar in both West and East Nordic. The Proto-Norse name of the God would be TívaR (not to be confused with the later plural) and even older the Proto-Germanic would be *Tīwaz. The common Nordic language was in the viking age called “Danish Tongue“ - or in Old Icelandic “dǫnsk tunga“. In 1200 AD the West- and East Nordic dialects had drifted so much from each other, that West-Nordic was known as “norrœnt mál“ in Old Icelandic. You have 33 place names in Denmark, 1 in Norway (Tysnes) and 0 in Sweden (place name Tiveden is not from Ti, but from plural Tívar meaning “Gods“). You have in fact more Ti/Tir securely attested place-names, than of any other Norse God in Denmark. A) A name was giving to a “shining Celestial sky father god“ in Proto-Indo European. Reconstructed as PIE *Dyēus ph2ter (or in the vocative *Dyeu Ph2ter = Oh Sky Father ! ), which gives us the following cognates in the daughter languages: The Aryan God called in Sanskrit Dyauṣ-pitṛ (= Sky Father), with the greek Zeus patēr (or “Zeu patēr“ in vocative case, but Diwós in genitive) and the Latin (vocative) Iup-piter or Iū-piter (Genitive case: Iovis). Umbric (closely related to Latin) has Iu-pater. In Proto-Italic likely *Dieus-pater, then later Old Latin *Diéspiter. They are all “Sky Fathers“ - celestial leaders of the pantheon. B) Another derivative of the root *dyeu- (to shine) is PIE *Deiwos (God, Celestial Being), that becomes Proto-Germanic Tiwaz and with the following forms in Latin (Deus = God; dīvus = divine, dīves = rich, blessed) and Sanskrit (devaḥ = God, deva- = divine). So clearly a very old name. Ti/Tir was “the God“ of the Bronze Age pastoralists that moved into Denmark around 2000 BC taking with them the Proto-Germanic language we speak a descendant of today and beginning in 1700 BC, they had created a distinct and unique “Nordic Bronze Age Culture“, that with time evolved into “Norse Religion“ known from the Iron Age and Viking Age. At some point you get a marked change in Denmark. It seems that an Odin aristocracy takes over associated with the expansion of the Danes. Their origin is still a debated mystery. From now one it is Odin that is the “Allfather“ and the leading Aesir, while Ti/Tir is sidelined. It seems it happens around 500 AD with the establishment of the Lejre Kings (near modern Roskilde in Sjælland). A hall from 500 AD has recently been found, 48 meters long and 11 meters wide, which echoes Beowulf and the hall Heorot of the Danish King Hrothgar of the Scylding House. Later viking halls were also built here until the capital with Christianity moved to the Roskilde location. A hall build in 550 AD is 40 meters long and 10 meters wide and around it a palisade fenced area of 10000 m2. It was burned down in the latter half of ~600's AD. This area is called “Bulbrogård“. Then a new hall was build 600 meters to the south, 48 meters long and 12 meters wide and - with a fenced area of 18000 m2 - that complex grew in size during the viking age to encompassing 25000 m2, until ~1050 AD where the site was abandoned. This area is called “Fugledegård“. Only 91000 m2 of the 500000m2 of the whole area has been excavated so far, so probably much more stuff will be found. The Tissø Lake was used in religious ceremonies at least from 600-1000 AD - with the special find of a Cult-house from the viking age period - and you have in all found 12000 items in the area. Most famous is the 1,8 kg Golden neck-ring and the valkyrie figures. Pommel: 3 cm thick, semilunar shape. The sword is double-edged with a wide fuller. On one side of the blade has been inlaid (likely with silver) an inscription, which cannot be read even with x-rays. Date: From late viking age to early middle age. Tissø had been used for religious deposits for a very long time. In the Mesolithic period you have Hunter/Fishermen living around the lake. The following Kongemose Culture (6400-5400 BC) shows a totally unique flint axe, that is an almost unbelievable masterpiece of flint crafting. It is 50 cm long, weight 2,9 kg and gives a bell-like ring when you tap it. The article shows a picture on page 45 and a drawing of it on page 46 and gives a tentative dating of 6400-5700 BC. It is likely a prestige weapon (not a tool) or an item made exclusively for a sacrificial offering to the lake. At Bulbrogård (the place of the later 550 AD Iron Age hall) you have also found a Late Neolithic grave site just next to the lake. English summery from page 39-42. The 11 graves surprisingly only contained 1 weapon. A skull fragment gives a dating of 2140-1930 BC. The flint dagger is very thin and 23,5 cm long and where widest 4,9 cm though only 2 cm at the hilt. Typology: Lomborg type IIA - typical for eastern Denmark. From the same area you have also found two urn-graves from the bronze age. So everything is burned so no weapons, but in the area a bronze razor and a Lur has been found: Haven't been able to find any images of these finds, though. Aner, E. & Kersten, K. (1973). Die Funde der alteren Bronzezeitdes nordischen Kreises in Danemark, Schleswig-Holsteinund Niedersachsen. Aner, E. & Kersten, K. (1976). Die Funde der älteren Bronzezeit Bd. 2. Holbæk, Sorø und Præstø Amter. The you have the Pre-roman Iron age La Tène sword from Tissø. Material and Interpretation. The Archaeology of Sjælland in the early Roman Iron Age. Publications of the National Museum. Based on the image of the Tissø sword in Liversage I guess that blade is ~55 cm to the small guard and ~60 cm to where the hilt begins. Then ~10 cm hilt. The viking hall was abandoned in ~1050 and the area is known to have been under the very powerful Hvide family, that was one of the first family of Christians and thus rose to great power in the middle ages (second only to the King). They had land and estates just around Tissø (Sæbygård and from 1284 Hallenlevslund). Sæby Church was build by Asser Rig. Amazingly no weapons to my knowledge has been found around Tissø associated with the Hvide family yet. The area was used for horse breeding, that was sold all over Europe, especially in huge numbers in the 1200's. Many crusaders apparently thought that Spanish and Danish warhorses were the best. Toke Trylle [unknown, birth and death dates]. Pagan nickname, but was apparently the first of the family that converted to Christianity. Toke Trylle could then have been the pagan magnet at Tissø up to ~1050 or he received the area after the pagan noblemen had been ousted. The verb “At trylle“ mean “to perform magic“, so as nickname “Magician"? Skjalm Hvide: (Born ~1035 - Died, later than 1102) + married to Signe. Fought with Danish King Svend Estridsen at the Battle of Niså in 1062 and was captured during the battle by Norwegian King Harald Hardrada. Skjalm (though Christian !) had a Berserk with him called Aslak, that really went Berserk and killed many Norwegians in the battle! Was given all of Sjælland to control for King Svend Estridsen. The nickname Hvide (white) is according to legend to contrast with the Danish pagan aristocrats of Scania called “Svarte Skåning“ (Black Scanian) as family name. Asser Rig (Born ~1080 - Died ~1151) + Inger Eriksdatter (~1100 - ~1157), daughter of Jarl (Earl) Erik of Falster. Esbern Snare (1127-1204): Build Kalundborg in 1170, fought with King Valdemar the Great at Grathe Hede in 1157. Absalon (~1128 - 1201): Studied Theology in Paris. Bishop of Roskilde (1158-1192), Archbishop of Lund (1178-1201). Gave Saxo the job to write the History of the Danes (Gesta Danorum), though the work wasn't finished before he died. Was prime instigator to the “Crusades against the Wends“, which lead to the conquest of Rügen and the Wendish stronghold of Arkona in 1168. They destroyed the statue of “Svantevit“. Episode described in Saxo's work. Both Absalon and Esbern Snare was behind building up a standing Danish Navy (not only called for campaigns), that was constantly patrolling Danish waters against Wendish attacks. They also build a lot of fortified coastal areas (-borg endings) around the eastern part of the country most exposed to the Wends. The sword in the middle is currently kept at the National Museum of Denmark. Some very beautiful things here Niels, thank you for posting them. The bronze age swords and axes are very finely decorated and in excellent shape. The La Tene sword is very nice. It's my understanding the tips are formed like this on purpose, though they look like a broken tip. Which is correct? Please keep posting more things on this and other Danish finds, thank you. Excellent resources. As is the sword on the left (and presumably the whole lot?)... though not on the museum site as far as I can tell, it does appear in "Swords of the Viking Age". The tip (or lack of) on the Lindholmgård sword seems original. 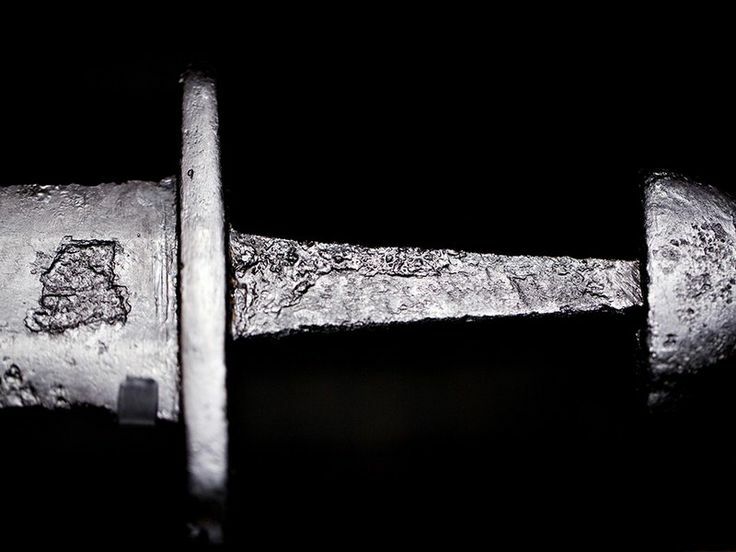 The Tissø sword is corroded, so it's really hard to tell how the sword “terminated“. Could have been exactly like the Lindholmgård sword ending with a “flat“ tip or be more pointy.